Rajendra Kumar’s original name was Rajendra Kumar Tuli. He was born on 20 July 1929 in Sialkot, Punjab (Pakistan). He belongs to Punjabi Hindu family. Rajendra Kumar also popular as a “Jubilee Kumar”. He was one of the most successful Bollywood actors in 1960s & 1970s decade. Rajendra Kumar married with a “Shukla”. He had a son “Kumar Gaurav” and two daughters. His daughter in law is a daughter of his one of the best friend “Sunil Dutt & Nargis”. 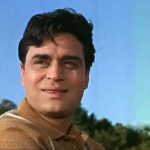 Rajendra Kumar made his debut in 1949 with the film Patanga. He appeared in a small role in this film. After this movie, he played a supporting actor in 1950s Jogan. His first commercial success was 1955 released Hindi film “Vachan”. This movie became Silver Jubilee Hit at the box office. In the year 1957, Kumar appeared in an Iconic Bollywood film “Mother India”. He played the son of Nargis. 1959 released “Goonj Uthi Shehnai” was one of the biggest hits of his career. After the failure’s in the 1970s he became the film producer and appeared in character roles. With the 1981 released Bollywood film “Love Story” he launched his son “Kumar Gaurav” in a Bollywood film industry. The film emerged as a blockbuster. Again in 1987, he produced film “Naam” starring “Kumar Gaurav” & “Sanjay Dutt”. Rajendra Kumar also did some Gujarati & Punjabi films also. For Gujarati Film “Mehndi Rang Lagyo” he honoured with National Honour by India’s former Prime Minister Shri Jawaharlal Nehru. He also appeared in 1975 released Punjabi film “Teri Meri Ik Jindri”. The film “Saajan Bina Suhagan” released in 1978 was his last commercial success as a leading actor. His last movie with his son was 1993 released Bollywood film “Phool”. First Film: Patanga (1949) Kumar appeared in a small role. Vachan – 1955, This was the first Silver Jubilee Hit. Mother India – 1957, Played the character son of Nargis. Goonj Uthi Shehnai – 1959, One of the biggest hits of Rajendra Kumar’s career. Dhool Ka Phool – 1959, Another Jubilee Hit in the year 1959. Mehndi Rang Lagyo – 1960, This is a Gujarati film. Actor honored with National Award for this film. Kanoon – 1960, Rajendra Kumar honoured with National honour for this film. Sasural – 1961, Musical Hit of actor’s career. Gharana – 1961, Another Musical Hit in the same year 1961. Mere Mehboob – 1963, This film won National Film Award for Certificate of Merit for the Second Best Feature Film. Dil Ek Mandir – 1963, Co-stars: Raaj Kumar, Meena Kumari. This was another Jubilee Hit by Jubilee Kumar. Sangam – 1964, This is a real classic romantic film. Ayee Milan Ki Bela – 1964, Co-stars: Dharmendra, Saira Banu. Superhit film by Kumar. Arzoo – 1965, Co-stars: Feroz Khan, Sadhana. Rajendra Kumar nominated for Filmfare Best Actor. Suraj – 1966, This was the 4th consecutive hit film in a row. Geet – 1965, This is the longest-running film in Sri Lanka’s history. Dharti – 1970, Another melodious musical hit. Aap Aye Bahaar Ayee – 1971, the film is remembered for the song “Mujhe Teri Mohabbat Ka”. Gora Aur Kala – 1972, Double dose of comedy & action. Jogan – 1950, appeared in a role of supporting actor. Ek Jhalak 1957 released Bollywood film. Talaaq – 1958’s film nominated for Filmfare Best Film. Mera Naam Joker – Kumar appeared in a supporting role in this 1970s released cult classic film. Ganwaar – 1970, This was actress Vyjayanthimala’s last film. Rajendra Kumar honoured with India’s 4th highest civilians award “Padma Shri” in 1969. He was also honoured with Nationa honour for the 1960 released films “Kanoon” and “Mehndi Rang Lagyo”. He was also honoured with Shastri National Award for his work in charity. Rajendra Kumar received 3 nominations for Filmfare Best Actor for the movies Dil Ek Mandir (1964), Ayee Milan Ki Bela (1965), Aarzoo (1966). He was also nominated for Filmfare Best Supporting Actor for the movie “Sangam”.